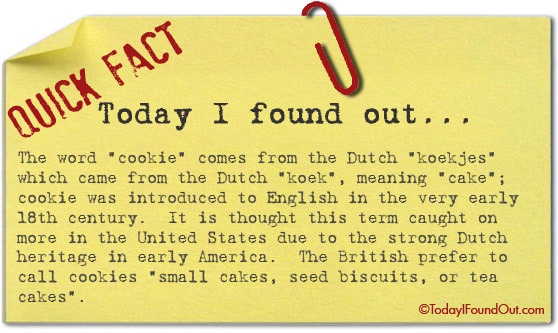 The word “cookie” comes from the Dutch “koekjes” which came from the Dutch “koek”, meaning “cake”; cookie was introduced to English in the very early 18th century. It is thought this term caught on more in the United States due to the strong Dutch heritage in early America. The British prefer to call cookies “small cakes, seed biscuits, or tea cakes”. Actually, British people call cookies biscuits, unless they’ve got chocolate chips in them. If they’ve got chocolate chips, they’re called chocolate chip cookies.